TALLAHASSEE, Fla. – Florida State coach Jimbo Fisher met with the media Monday to recap last week’s lost to North Carolina State and look ahead to the Seminoles’ first true road game against Wake Forest on Saturday (3:30 p.m., ABC). Here are highlights from that conversation. 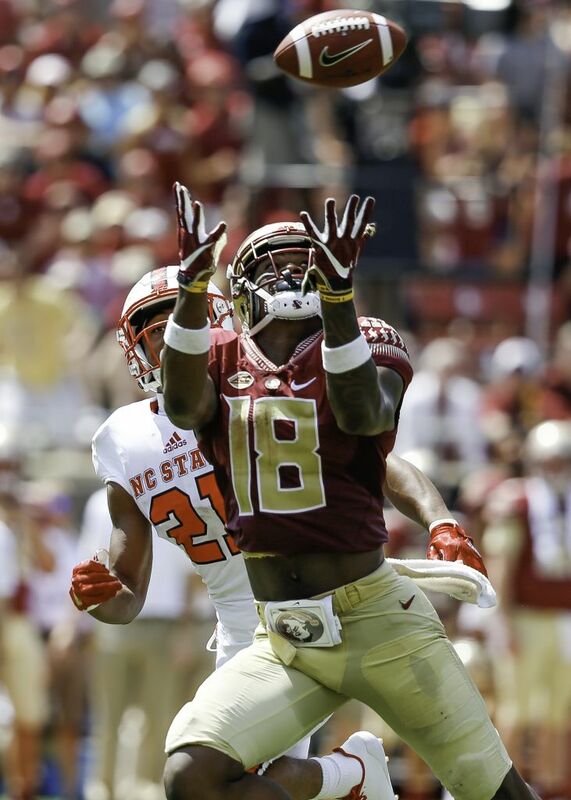 The Seminoles got good news Monday when Fisher announce that receiver Auden Tate (shoulder) and linebacker Matthew Thomas (back) are both “day-to-day” after leaving the NC State game with injuries. Both players are starters, and their respective units felt their absences during the game. Tate had already blown past his career-highs in catches (nine) and yards (138) when he left. And Thomas was one of two starting linebackers to miss significant time. Fellow senior Jacob Pugh was out for much of the second half after drawing a targeting penalty. Fisher said that James Blackman “did some really nice things” in his debut, and that he’s encouraged by Blackman’s room to grow moving forward. Blackman seemed to find his stride after connecting with Tate for a 24-yard gain on a third-and-eight. That was part of a run of 15 completions in 19 passes that included a four-yard touchdown. “It’s like, ‘OK, I can do this,’ you know what I’m saying?” Fisher said. “Then you get going, And that’s like anything, but it did get him kick-started, and he took off. FSU’s defense didn’t have a statistically bad day against the Wolfpack, but Fisher would like to see his defenders start with a little more spark after NC State scored 10 points on its first two drives of the game. That put the Seminoles in a hole that they spent the rest of the game digging out of. Florida State moved the ball well enough against NC State – the Seminoles actually out-gained the Wolfpack by a few yards – but missed out on opportunities to tie or take the lead once it moved closer to the end zone. FSU had six drives end inside the NC State 20-yard line. They finished the game with four field goals and one touchdown to show for it. Combined with their season-opener against Alabama, the Seminoles have scored touchdowns on two of eight red-zone visits. Fisher, however, noted that the line between success and failure at that part of the field can often be very thin. Wake Forest is 4-0 for the second straight season and, like they did during their run of success in the mid-2000s, the Demon Deacons are making things happen with a tough defense and a sharp, experienced offense. Wake ranks 35th nationally in total defense (328.5 yards per game) and is scoring nearly 38 points per game. Although they narrowly escaped with a 20-19 road victory at Appalachian State last week, the Demon Deacons have beaten the two FBS opponents on their schedule – Boston College and Utah State – by a combined score of 100-39.